Finding it impossible to rehydrate dull, lacklustre skin? This bio-fermented probiotic elixir hydrates your skin from within, enhancing radiance by boosting moisture levels and restoring electrolyte balance. Every 15ml serving is loaded with skin-loving probiotics and prebiotics plus natural electrolytes, minerals, vitamins and plant nutrients from coconut water, lemon myrtle and aloe vera to help re-hydrate your skin and improve your digestive health. Like drinkable skin care, this beauty-boosting, bio-fermented probiotic elixir has been scientifically formulated by The Beauty Chef to rehydrate dull, lacklustre skin, reducing the appearance of fine lines as it goes. Starring a clever concoction of skin-loving probiotics and prebiotics plus natural electrolytes, minerals, vitamins and plant nutrients from coconut water, lemon myrtle and aloe vera, Hydration Inner Beauty Boost hydrates your skin from the inside by restoring electrolyte balance. Restoring your body’s hydration levels not only makes your skin more radiant, it also boosts circulation and blood oxygenation and helps to kick-start your metabolism, which in turn enhances skin health, boosts your energy and benefits your overall wellbeing. The potency of all the ingredients have been enhanced by The Beauty Chef’s exclusive Flora Culture fermentation process, which makes the nutrients more bio-available and better absorbed by the body’s cells. Better still, this is free from artificial colours, sugar and gluten and is suitable for vegans. All in all, a great way to supercharge your skin care routine! For an extra potent skin-boosting potion, pair the Hydration Inner Beauty Boost with your daily dose of The Beauty Chef’s GLOW Powder. 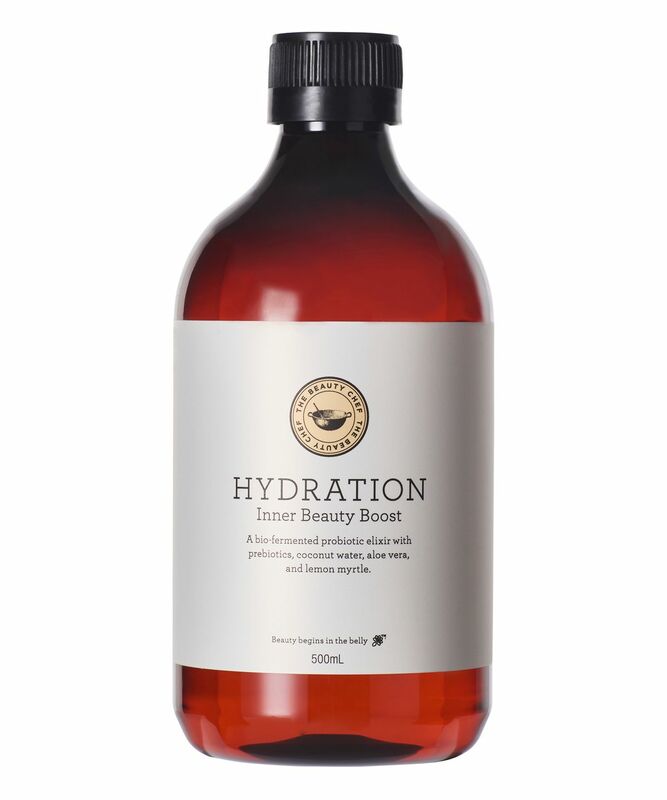 Or simply mix a 15ml serve of the Hydration Inner Beauty Boost with 200ml of filtered water and consume once daily. You can also add the Beauty Chef’s Inner Beauty Boosts to your favourite smoothie or dessert recipes. The Beauty Chef’s HYDRATION Inner Beauty Powder is organic, gluten free, vegan and contains no artificial flavours, preservatives, colours, additives, nuts, lactose, dairy or sugar. The Beauty Chef products are not tested on animals and proudly Australian made. I used it mostly in summer. It tastes amazing and my skin did look more hydrated. While I still have to keep up to see the long term benefits, I must say that having this feels like a treat in the AM and PM. I am looking forward to it everyday, it tastes so nice and it feels like I am doing something good for my skin. I can't wait to see if it actually has positive effects as well. I am at my second bottle and I love it. I am not sure if and what is the effect on my body yet BUT drinking this is the first thing that I do in the morning. I do feel my skin looks better and its smoother and plumper, but I am doing so many things for my health lately that I cannot be sure what is the source of this. I adore the coconuty taste. I mix 30 ml with 500 ml water and just drink it slowly while I plan my day of success. This product and the Inner Glow powder succeeded in the impossible task of making me drink more water and if only for this fact - I declare myself happy. I love them both and I will repurchase for sure. I am 2 weeks into using this product and I could not recommend it enough. I have incredibly sensitive, dehydrated skin (I'm Aussie living in the UK, which makes it worse) and I suffer from eczema. Since using this, I have noticed a remarkable difference in the the hydration levels of my skin. Where I would normally see dehydration lines around my mouth appearing throughout the day, they are now far less severe. My makeup is staying on and looking flawless and I have less dry skin, meaning I am exfoliating less. An amazing find! This is absolutely brilliant. I suffer with dry and hormonal skin. Not only has it helped give me much more glowing and spot free complexion but I swear it’s really helped my digestion too! I started to drink this daily for about a month now and I can say that my skin is looking so much better. I really enjoy the coconut taste and when all mixed with water- it makes it easy to drink it before you know it you've drunk 1L within an hour. Definitely will be repurchasing soon.